I’m in the mood to train, train, train! Probably because I haven’t been able to ride due to vacation + the rain + more vacation on the horizon. To get my training fix, I’d love to hear from all of you lovely hunter/jumper ladies what your favorite exercise is to school at home! I’ll be the first to admit that I’m not the queen of formal exercises. My rides are a mix of working on me (aka Simon goes into school horse mode while I hold the two point forever or work on no stirrups) and doing very simple things strung together (transition, pole, transition). Still, I think the best exercises can be super simple. Since I don’t prefer jumping outside of lessons, the exercise I spend the most time doing is simply cantering a pole while doing between a 10-20 meter circle. This really helps my eye, and since it’s just a pole if I botch a distance it’s not danger town. I will usually go about 10 times in his harder direction and 5-10 in the easier one. I’m sure the amount of times is personal preference, but George Morris says not to drill so I tend not to do any more than that. What about you? What’s your favorite exercise to work on with your horse? Want to add the Blog Hop to your site? 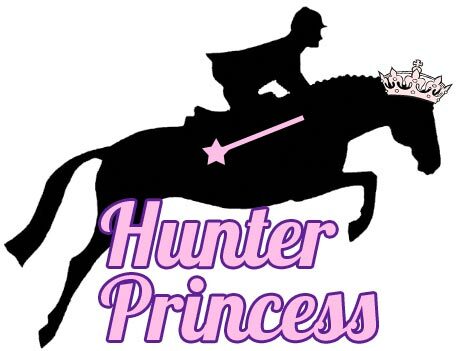 Get the Hunter Princess Week 9 Blog Hop Code! I am a huge fan of working on ME when my trainer isn’t helping me work on my mount. For me that means touching on the no stirrup work, as you previously mentioned, and my own rendition of strength building my lower leg. I sit two strides of the trot, followed by standing two strides, sit two, stand two. You’ll feel the burn. Trust me. As far as adding some things to the mix to keep it interesting for Simon to, I set up “courses” of ground poles which include canter poles set for bounce strides, bending lines (working on direct and indirect routes), regular 5 stride lines (then catching it twice in a row, first getting the number then adding and visa-versa). I will school on the flat pretty vigorously too. Lots of serpentine, collecting on the short sides, extending down the long, legging in to a 10m circle, legging out to a 20m (all of which had to be thoroughly explained by my new trainer who specializes in Eventing which I needed in order to expand my H/J brain). If you want super specific exercises including distances, etc. email me! I love double posting! It’s a great exercise – I need to do it more often. I do lots of lengthening and shortening as well as transitions. Depending on the horse I do a lot of lateral work as well. I find this gets the horse responsive and supple, and works those hind end muscles really well. My favorite exercise for my students is double posting (up, up, down, or down, down, up, or any variation different than just up, down, up, down). This simple exercise helps with balance and strength, and it sounds easy, but really isn’t at first. 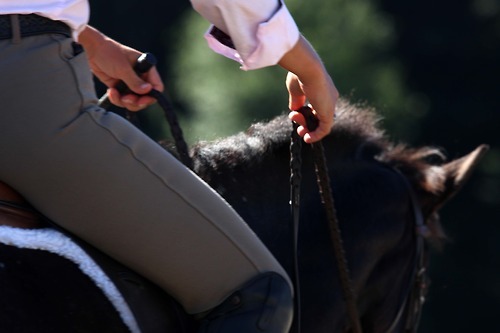 My favorite exercise for my horses is to halt over a pole with the front legs on one side of the pole and hind legs on the other, from both the trot and canter. This is an amazing exercise to teach your horse to not haaang on your hands through the down transition. I’m not a hunter, but I do want to share my fave exercise because I think it will help any horse in any discipline. It’s called the 10-10-10. 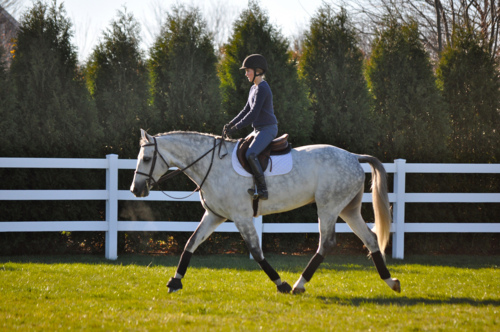 It’s considered a dressage exercise, but it really gets a horse sharp on the aids and organized. 10 strides walk, 10 strides trot, 10 strides canter. Want to make it harder? Mix it up. 10 strides trot, 10 strides walk, 10 strides canter, 10 strides walk, etc. Even harder? Do it in 2-point. Or without stirrups. It’s a very versatile exercise that’s great for any level fitness horse in any discipline, and really helps to get them soft, collected, and focused on you. Let them trot or canter after doing this exercise for 15 minutes, and all they want to do is lengthen! It’s fantastic. To work on myself without a trainer I used to live in posting or sitting trot with no stirrups. You’ll feel the burn and your balance will benefit. my favorite book of exercises is Linda Allen’s 101 jumping exercises. Staci has a copy in the barn office. Take a look at some of the stuff in there, a lot of it can be done with just poles on the ground but the exercises are really challenging and a ton of fun. Let’s do some! !